According to the World Economic Forum, The United States Department of Defense is the largest employer in the world with 3.2 million people on its payroll. 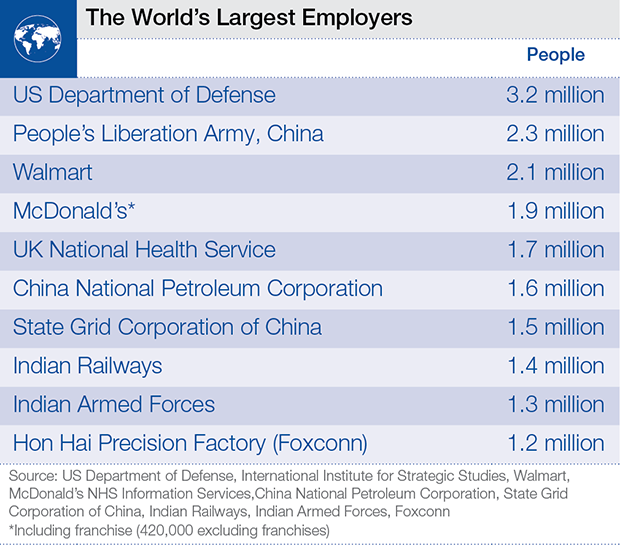 The Peoples Liberation Army of China comes in second at 2.3 million, followed by Walmart at 2.1 million employees. If only active duty troops were counted in the payroll, the list would be rearranged to feature China with the largest at 2.3 million, followed by the U.S. with 1.6 million and India with 1.3 million.